A former Fairfax County School bus driver has been charged with assault after a bus attendant told authorities the driver appeared to be fondling a student who has special needs. Johnnie Miller, 66, retired May 30, according to Fairfax County Public Schools. The allegation against him came earlier that month. Search warrant documents reveal that the attendant on Miller's bus contacted authorities to report a possible sexual abuse of a 13-year-old girl. The attendant said the victim, who attended the Key Center School, needed to be strapped into a special seat. The attendant believed that on May 6, Miller touched the child inappropriately as he strapped her in. Transportation supervisors tried to review the video from the bus camera on the date the attendant observed the incident, but that video had been recorded over. 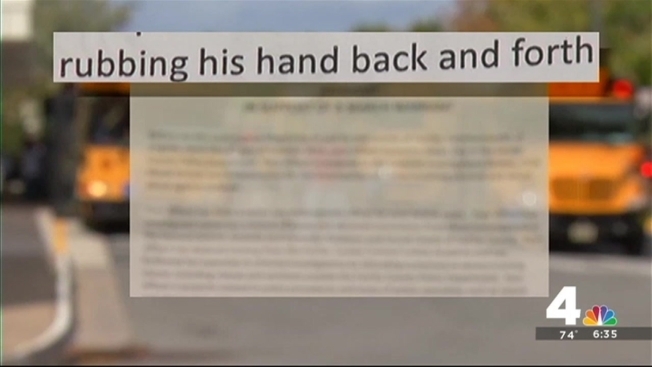 The search warrant document says they checked the video from May 8, and were able to see Miller "rubbing his hand back and forth" while strapping the girl into her seat. The supervisors who viewed the video say the student was yelling, and that when the attendant went to confront Miller, he drew his hand away. When confronted by supervisors, Miller said it was "just a little tickle game." School officials placed Miller on administrative leave, contacted Child Protective Services and a police investigation soon began. "We're always concerned about the safety and well-being of our students, and we are thankful that the attendant brought this alleged iniciden to our attention," schools spokesperson John Torre said. Parents at Key Center School said they learned of the allegations through the media. They were not notified by the school when allegations surfaced last year. School district officials say parents were not notified because a decision was made to handle it internally, but parents now will be informed about the alleged incident. Miller, who lives in Fredericksburg, had been a driver for the county since 1991. He could not be reached for comment Tuesday. He was charged Sept. 11 with simple assault and battery in connection with the incident. He is due in court Oct. 29.